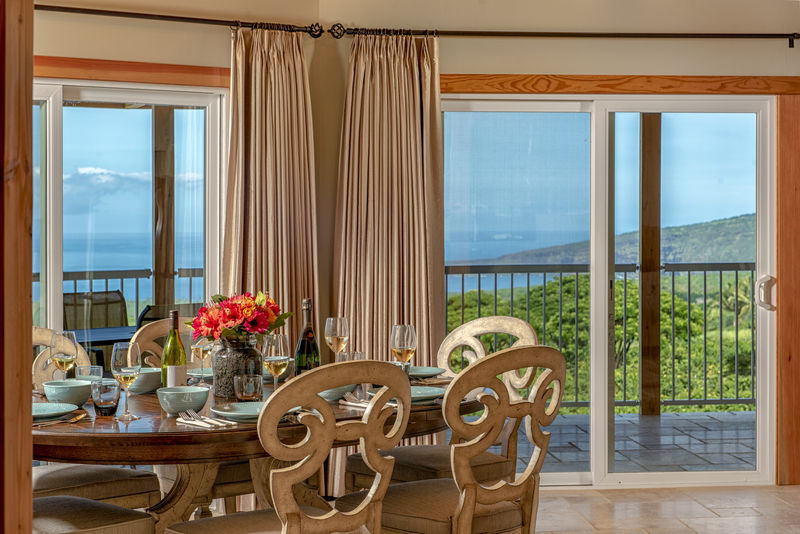 Covered al fresco dining with a view of Mokuakae Bay and the shimmering Pacific beyond. 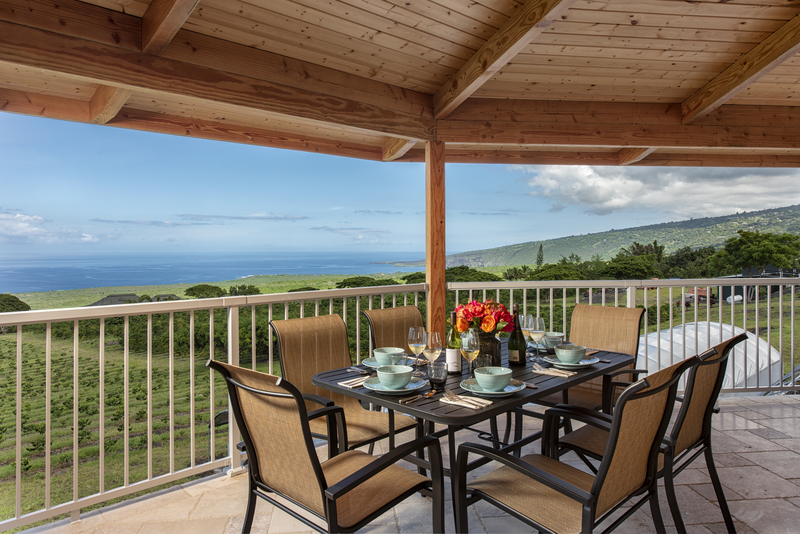 Lanai patio seating and wrap around porch Entrance to the Decadon house on a working coffee plantation. 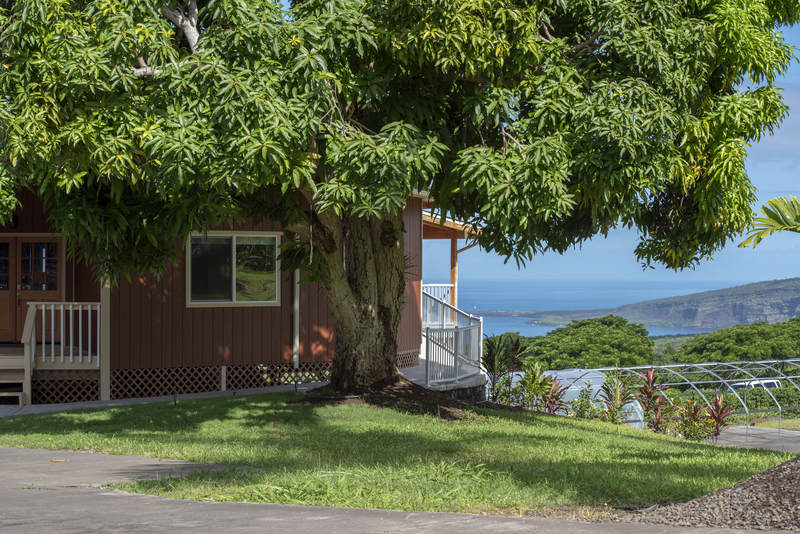 Beautiful view of this 10-sided home on Hawaii's Big Island. 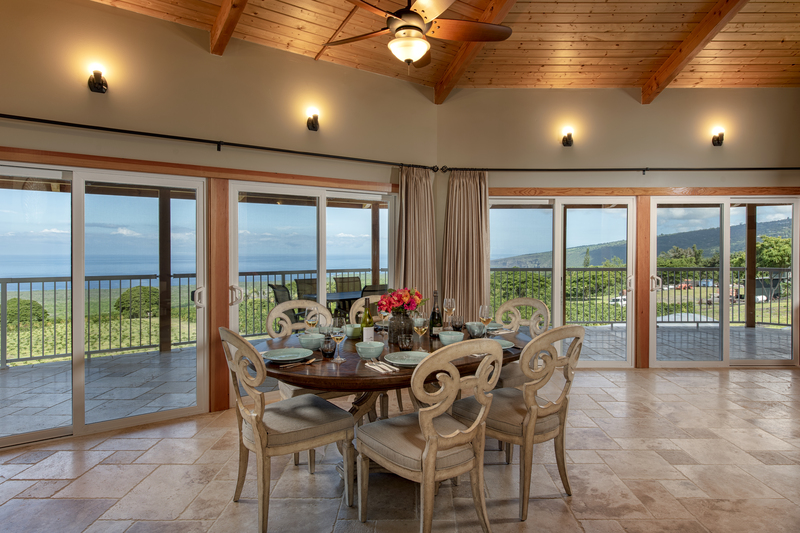 Spacious interior dining area with endless views. Open kitchen with everything you need to enjoy your stay - add the food and the fun and you are all set. 3 high top stools at the kitchen bar make it easy for everyone to eat together inside. 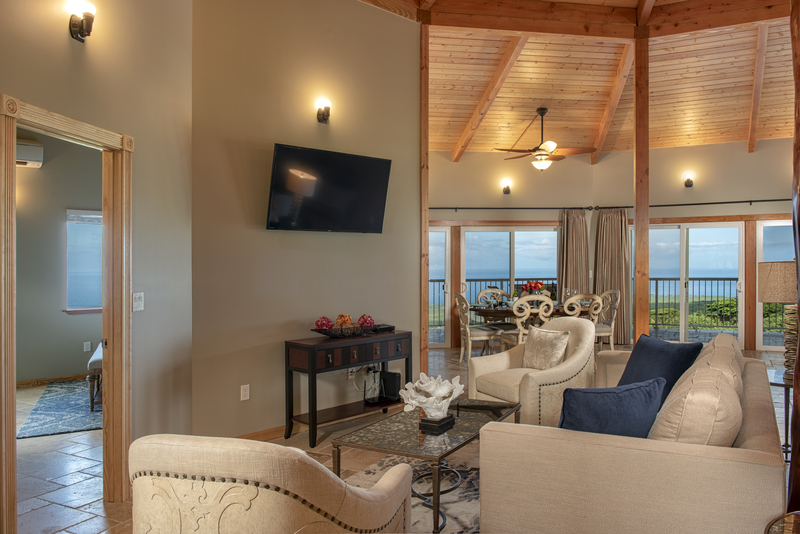 Living room area where you can enjoy ocean views and your flat screen TV comfortably, and at the same time. 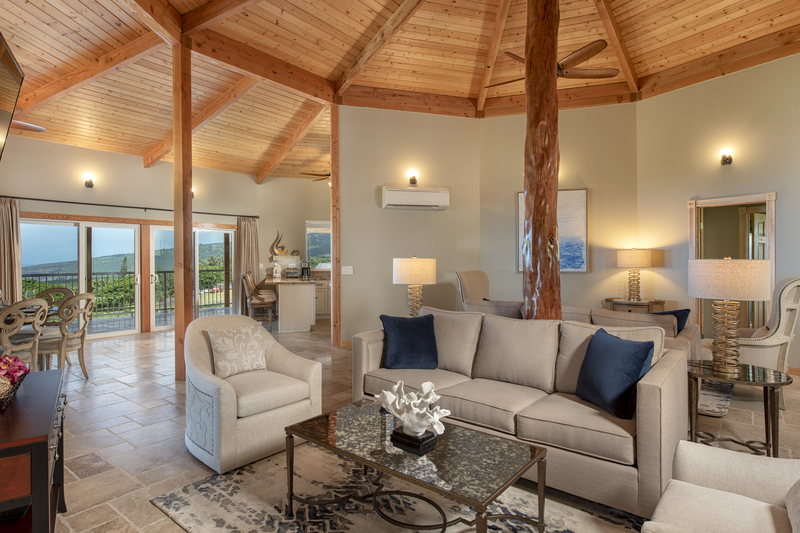 Expansive living room with vaulted ceilings and 2 pull out sofas. Comfortable seating cluster with 50" flatscreen TV. 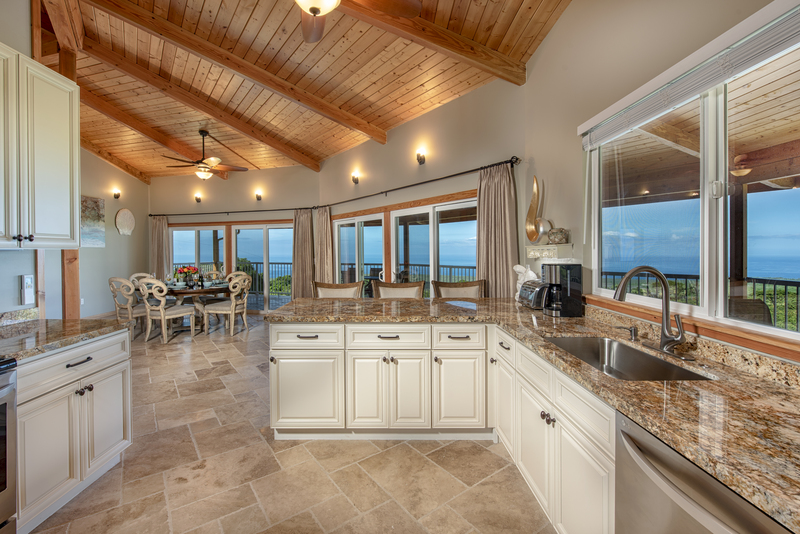 Open floor plan with flow from living room to dining to kitchen. Drone of this Decadon House. 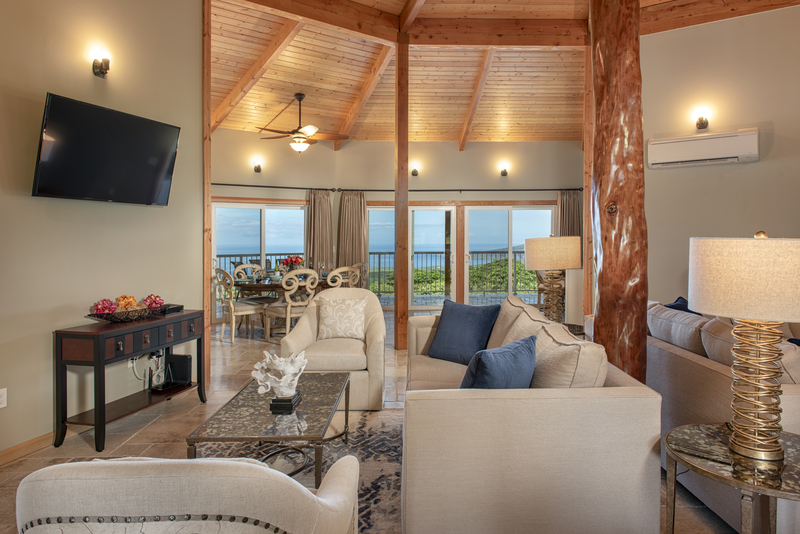 Master king bedroom with ocean views, ensuite bath and flat screen TV. 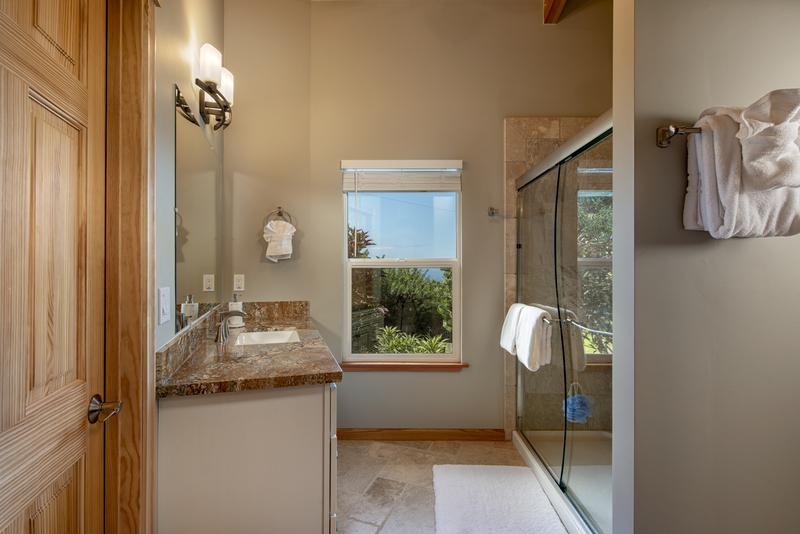 Master bath with walk-in shower. Second bedroom with queen bed. Third bedroom (a queen) with flat screen TV. Guest bath with shower/tub combination. 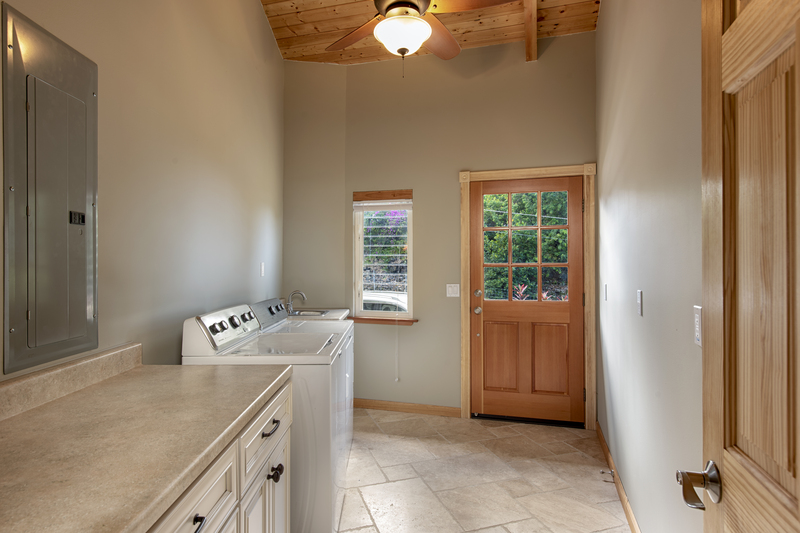 Laundry room with washer and dryer for your convenience. Back yard area of this home. Unobstructed ocean views from the wrap around balcony. 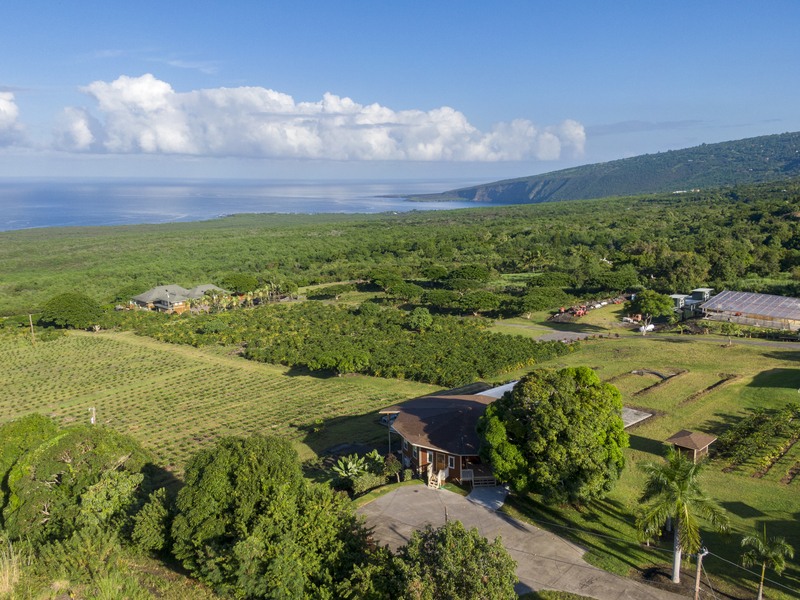 On one of Hawaii's most pristine coffee plantations Bay View Farms. Endless views. 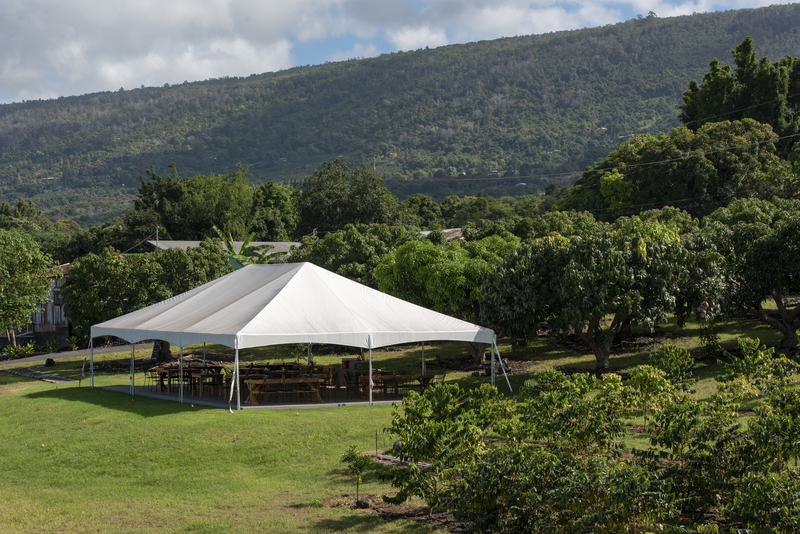 Looking to host your wedding or event? We're ready for you! 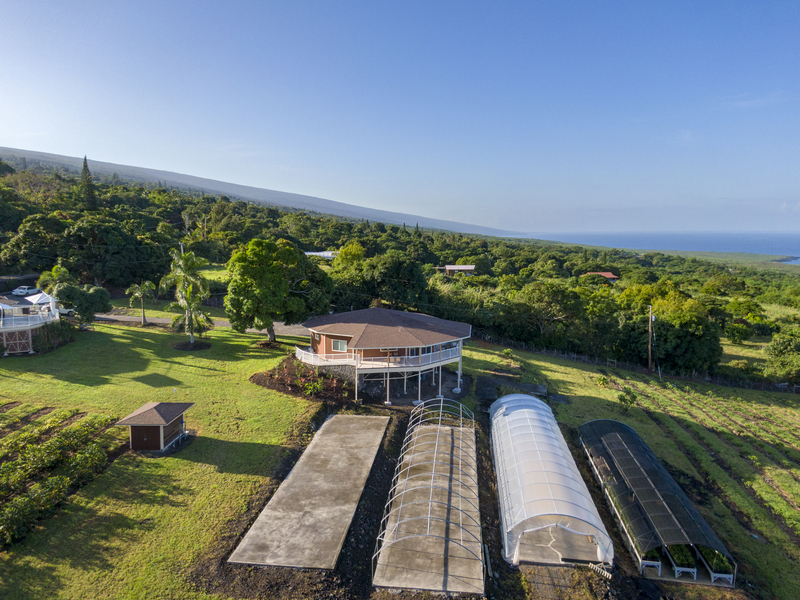 This unique newly remodeled home with 10 sides (deca) offers panoramic ocean and plantation views from its wrap around balcony – the outside dining table is the perfect perch from which to take in the spaciousness and beauty of this Bay View Farms working coffee plantation on Mokuakae Bay on Hawaii’s Big Island. 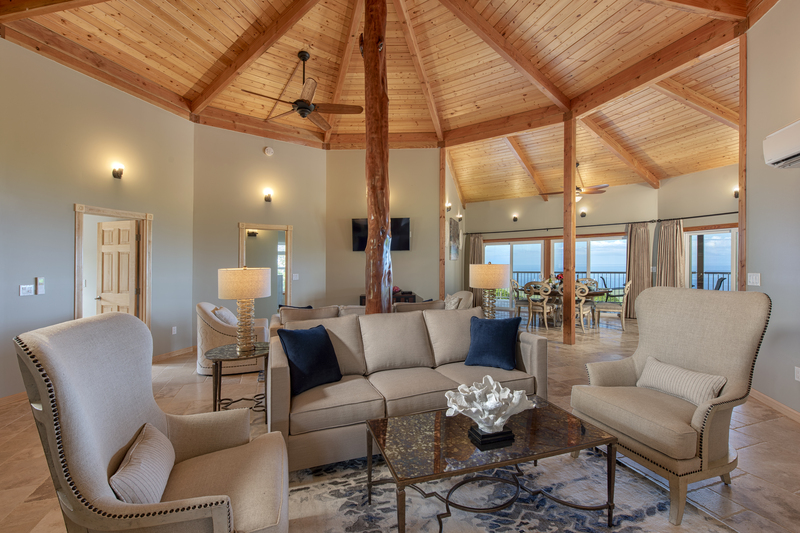 Enter this home and find yourself in the living area of a spacious ocean view great room with floor to ceiling windows and sliders to the balcony. The living room is equipped with with a 50” flat screen TV, and comfortable cluster seating, with 2 full, or double, sofa beds. Adjacent to the living room is the dining area with seating for 6. A modern kitchen with a breakfast bar with 3 high top stools makes it easy for everyone to eat indoors and/or to supervise the cook. The kitchen has everything you need to create meals and snacks for you and your family/guests – just add the food and the camaraderie and have fun. 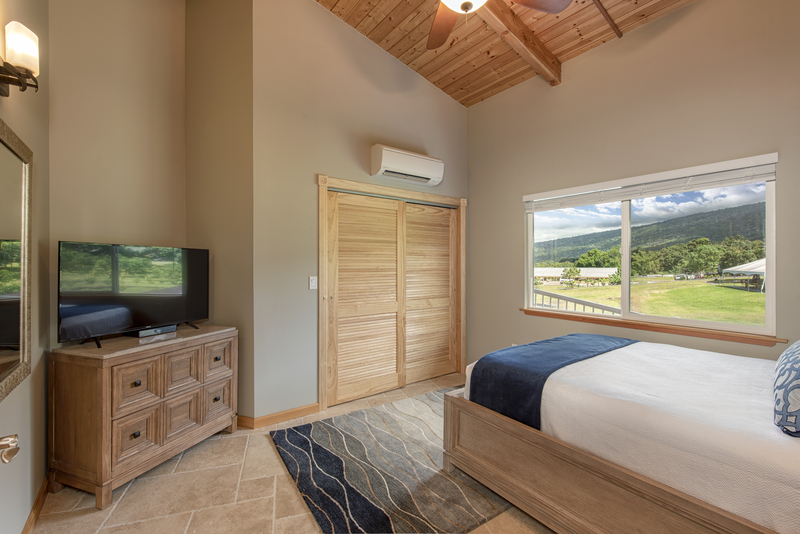 The king master bedroom has a 50” flat screen TV and an elegant en suite bath with a large walk-in shower. 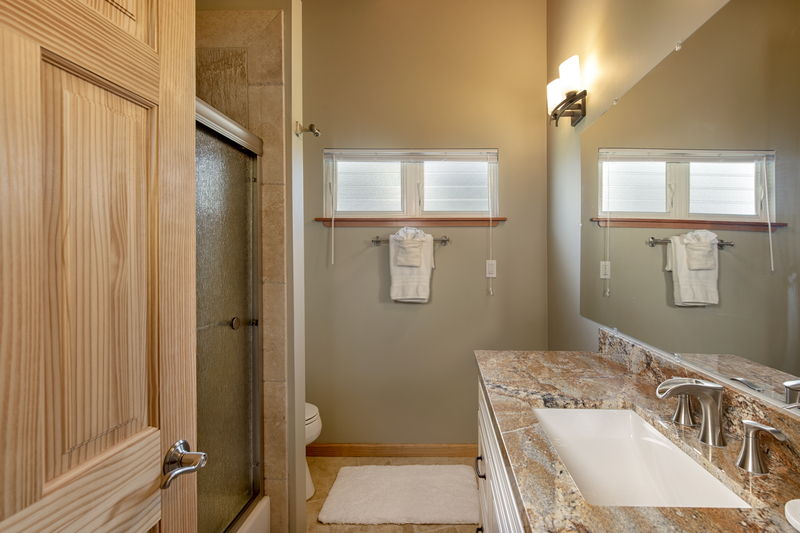 The 2nd bedroom, with a queen bed, and the 3rd bedroom with a queen bed, share a bath with a shower/tub combination. 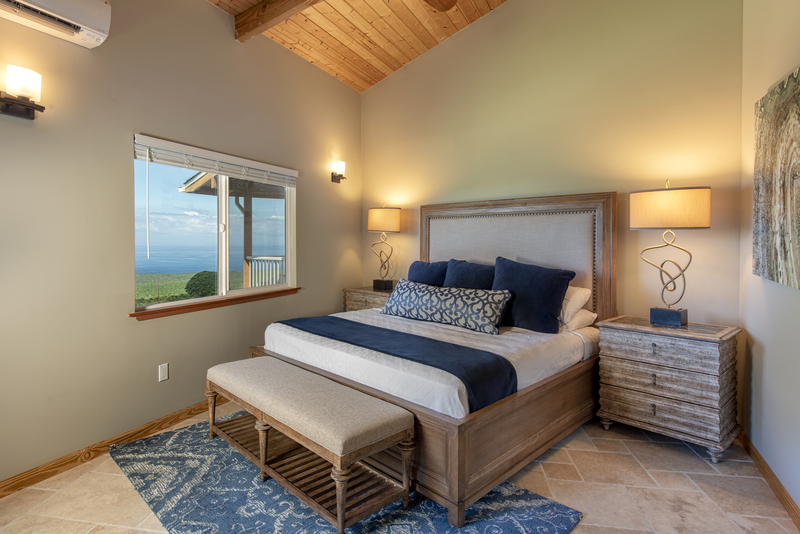 This home comfortably sleeps 10 in beds and all bed and bathrooms are outfitted with an ample supply of premiere linens for your ultimate comfort. 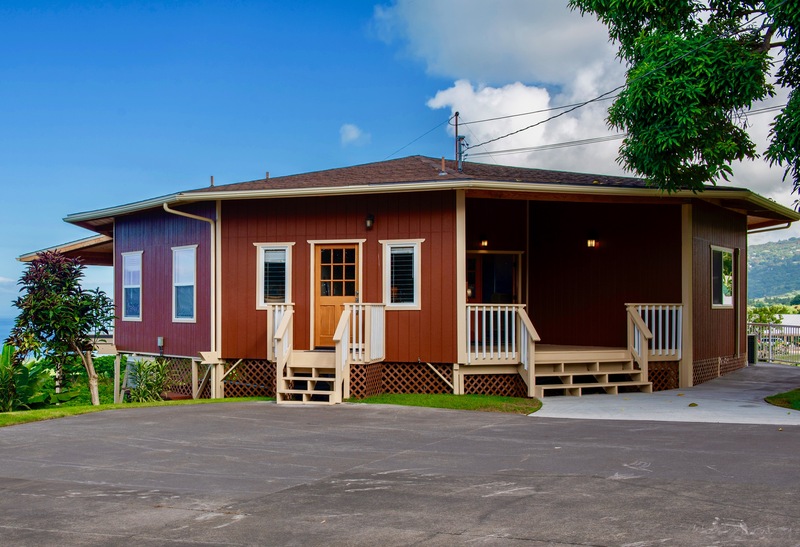 Additional amenities include a separate laundry room with a washer and dryer, WIFI and cable, air conditioning, and parking for 5 cars in the driveway. Pets are also allowed in this home. 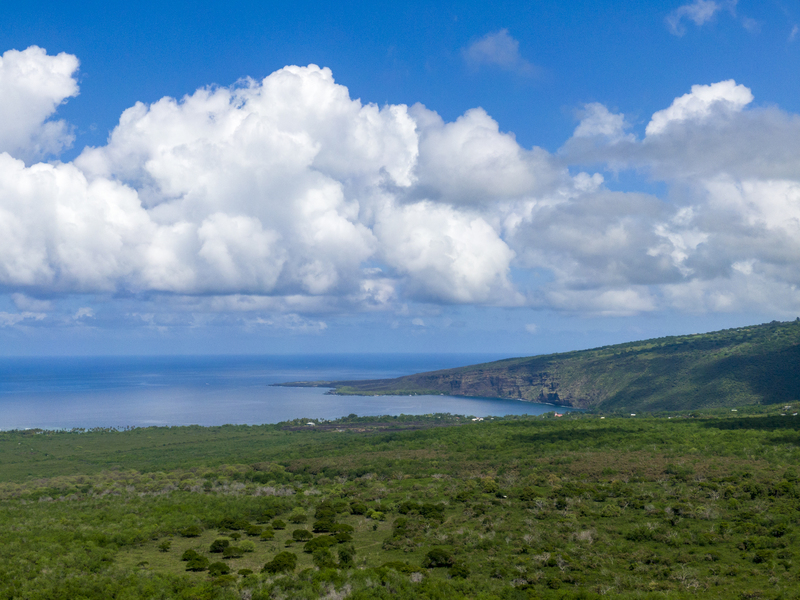 This is a great vacation haven when you want to keep things simple so you can enjoy the beautiful views all the grandeur around you and create beautiful memories that will last a lifetime. 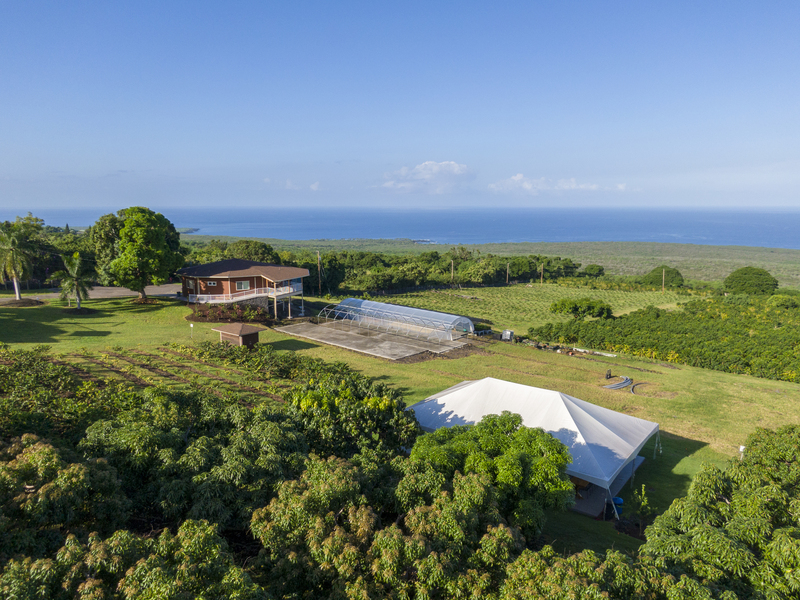 - The open, flowing spaciousness of the great room that extends out to the wrapping balcony with 180 degree ocean views and the 18-acre working coffee plantation. 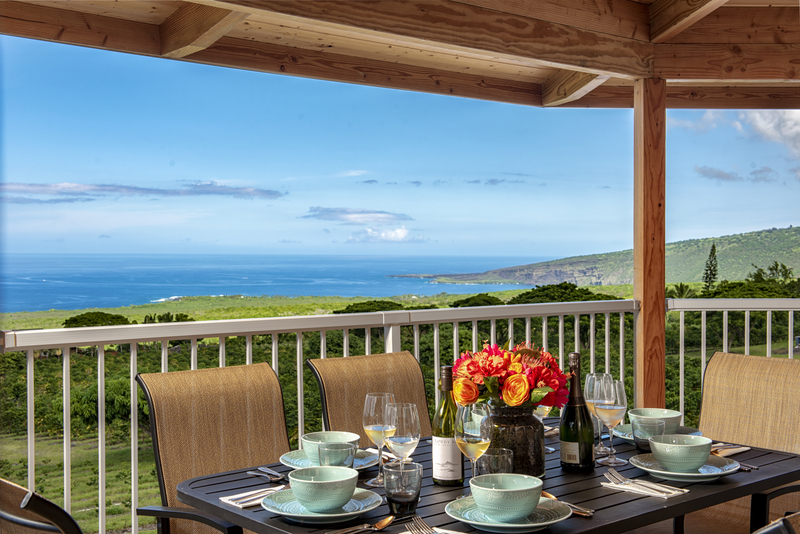 - Its proximity to the ocean – just a 2-3 mile ride and you’re there. And while you are staying here, you can learn more about the inner workings of a coffee plantation too. 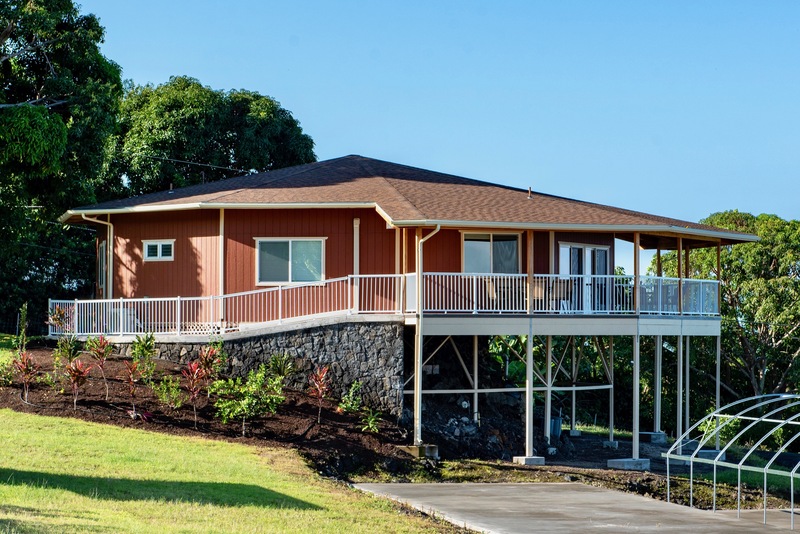 - It can be rented with the larger home (HI-5249) 6 bedroom, 6.5 bath house not far away on the property for weddings, family reunions, or other special events. - There is no smoking inside or outside this property – NO EXCEPTIONS! - This home has air conditioning at no additional cost. - Please note that our rental agreement includes a no tolerance policy regarding excessive noise, over-occupancy or unauthorized events. - Special events are considered so please contact us for more details. We were hesitant to pick a place with no previous reviews but to my surprise the property was much better in life than in the pictures. We absolutely loved everything about the property! The location was perfect to Kona downtown and other beautiful sites. The house was fully equipped with every day needs. 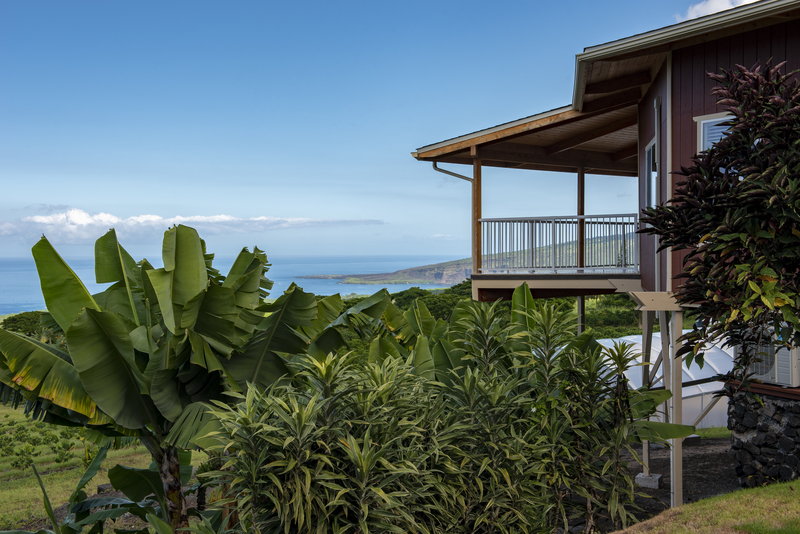 The Lanai was the best part of the house, the incredible views were to die for! We also loved a coffee tour and very tasty coffee. We will be back soon! - Reviewed By Veronika P.
We loved the location and the management company. We wanted to check in earlier and they accommodated it. The property is just like it looks in the pictures and even better. The views are breathtaking! The kitchen and bathrooms are fully stocked and had everything we needed. We all enjoyed our stay a lot and will be back again. - Reviewed By Veronika E.